You can pray the breviary in Latin you want to. Latin is for ordinary people. Latin is for everyone. We may think learning a language takes too long. But the vocabulary in the breviary, whether you use the modern Liturgy of the Hours or the traditional Roman Breviary, is quite limited and can be learned by anyone. Many people have studied a foreign language in their youth and later forgotten it all. Students of Latin have an easy remedy for this in the breviary. The daily, prayerful grazing through the beautiful psalms, hymns and prayers of the breviary will keep your Latin fresh for the rest of your life. The Latin breviary is not only for priests and religious. It is for everyone. The Church encourages the laity to participate in the Divine Office. Many have prayed the Little Office of the Blessed Virgin Mary as a sign of their devotion to Our Lady and in fulfillment of the requirements of the brown scapular. The Second Vatican Council reaffirmed the Church’s commitment to both liturgical Latin and the lay recitation of the breviary. What is offered here is a simple plan. If you follow this plan, you will quickly find yourself praying the office in Latin, and understanding what you pray, and enjoying it. How do I begin? Begin with Sunday Night Prayer. This is the shortest office and may be prayed any night of the week. Sign up for a free course, “Latin Breviary: Sunday Night Prayer” at Memrise.com, and you will be ready in no time. Where can I get my own Latin breviary? Go to our Resources page for digital and print editions. How do I grow my vocabulary expansively? For this task, LingQ is quite useful. For a small monthly fee you will have access to an excellent foreign-language reading application (web-based and smartphone app) which is geared toward broad reading and acquisition of vocabulary. And they support Latin. Look up words on the fly. New words and context are saved automatically. You choose what to read: Import scripture, Patristic sermons, stories from the Golden Legend, classics, Aquinas, or anything at all. Watch the video below for more on LingQ. 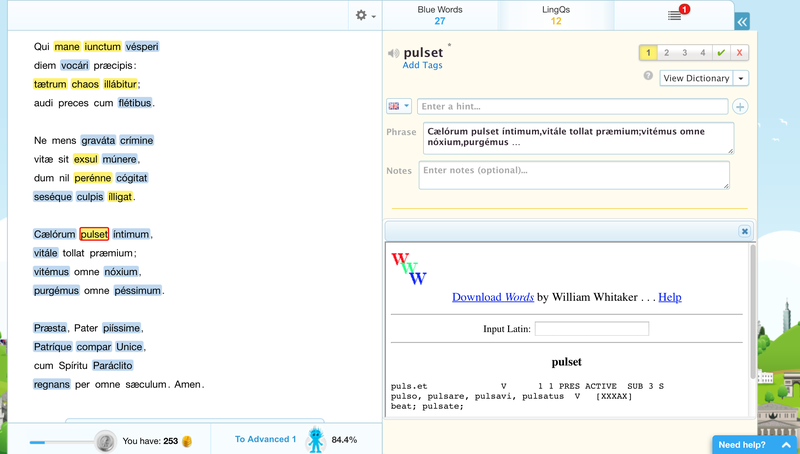 nodictionaries.com is another an excellent tool for reading large texts without getting bogged down. Paste in your text and it creates a display with dictionary entries located beneath each word.